Creating your own wedding decor might seem daunting – and trust us when we say there are some things you can easily make yourself, and others you should leave to the experts. Designing the wedding arch for example, isn’t for everyone. But DIYing some fun photo props, customized place cards, or a cake topper that can be kept as a special keepsake for years to come? That you can totally tackle. Did we mention that these projects are also budget-friendly? It is often the details that make a wedding memorable. An alternative to traditional paper place cards, these Love Doves will allow you to get creative and display an elegant addition to your wedding centerpieces. Use these stencils to draw the two doves and the stand, then write out your guests’ names in your own handwriting. Your guests will appreciate the handmade touch, and might even take these home. To save time, you could replace the stand with a thick piece of card, and simply stick the Doodled doves and name on top of the card. We highly recommend this project because it really is a lot of fun – from making them to using them on your big day! Your guests are going to love crowding around the photo booth area with these striking props. Print out these stencils link to make these wedding-themed comical photo props, or draw your own to Doodle over. Place a DoodlePad link on top of the stencil to make Doodling easier. Use bright colors to make them pop, or keep them sleek and stylish in a muted palette to suit your day. Make your own props for birthday parties, halloween, or just any photo-worthy occasion. 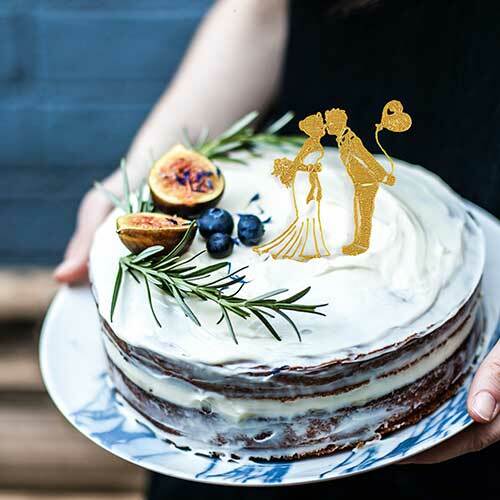 Having trouble finding your dream wedding cake topper? Why not make your own. This project requires no artistic skills, yet gives you something that looks so good your guests will think it was professionally made. You can make this romantic couple silhouette using this stencil, write out a meaningful quote, or design your own sweet decorations using the same technique. Use a thinner Create Pen Nozzle to draw fine details. We hope that you feel inspired with creative ideas for your big day! There’s so much you can make that is not only budget-friendly, wows your guests, and most importantly, allows you to have a truly bespoke wedding.